The Philadelphia Cheesesteak. There are those that revere and defend it with such devotion that I’m a bit hesitant, and quite frankly a little concerned for my safety to say… I’m not a fan. The beef is tasteless, the bread is dry, and the cheese… is often some conglomerate of processed matter. Now in the defense of the Cheesesteak, I have never actually had one from Philly. Perhaps it’s just one of those things like southern BBQ, unless it’s made by a local, it just doesn’t taste right. Being an “outsider,” I think that sometimes not knowing the rules, can in actuality, fuel creativity and push you to think outside of the box. I put a hapa spin on this Cheesesteak and used bulgogi beef – a fantastic Korean dish that’s made of marinated and grilled meat. The flavors are intense and totally addicting. When marinating the beef, you really want those flavors to penetrate the sirloin – so marinate the meat overnight. To keep it tender, be sure to slice against the grain – this will produce shorter muscle fibers, giving you a more tender bite. Generally, a Cheesesteak is topped with sautéed onions and green bell peppers. But in this recipe, I’m topping it with full-on tender, savory and sweet caramelized onions. Is your mouth watering yet? I know mine is! Finally, the pièce de résistance… ooey, gooey, melted provolone cheese. 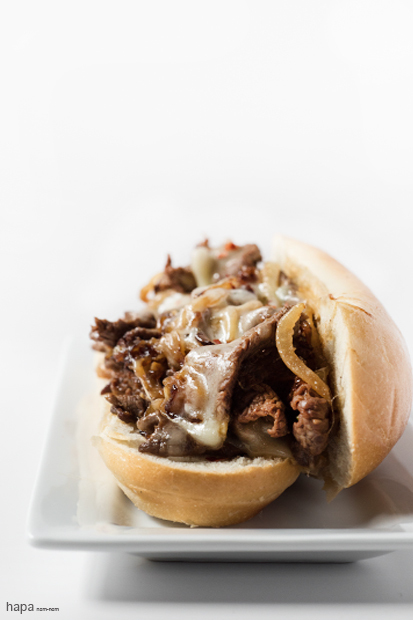 Seriously guys, this Bulgogi “Philly” Cheesesteak is definitely drool worthy. In a large bowl, combine the garlic, yellow onion, scallions, soy sauce, sesame oil, brown sugar, ⅛ teaspoon black pepper, and gochujang. In a large zip top bag, add the meat to the marinade and mix well, making sure that each piece is throughly coated. Cover, refrigerate, and allow to marinate for 2 hours. To caramelized onions - melt the butter and olive oil in a large saute pan over medium heat. Add the onions and cook, stirring occasionally. Cook for 35 - 40 minutes until soft and caramelized. Add the balsamic vinegar and season with salt and pepper to taste. Toss to combine and set aside. Using a heavy-bottomed skillet over high heat, add a ¼ of the beef along with some of the marinade and toss to cook for about a minute. 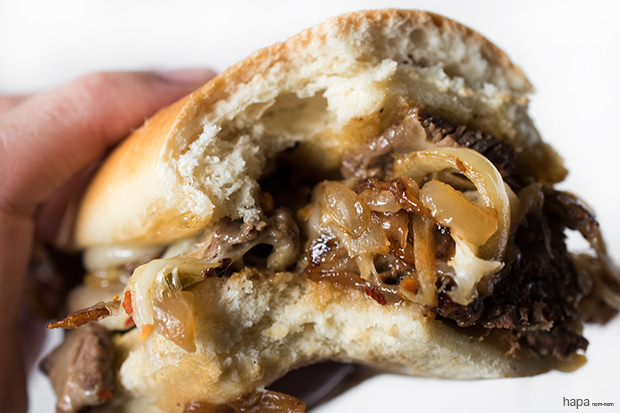 Form the beef into the approximate length of the hoagie roll and top with a ¼ of the caramelized onions and ¼ of the shredded cheese. Add a tablespoon of the reserved marinade to the pan (this will create steam, which will help keep the beef moist and help melt the cheese). 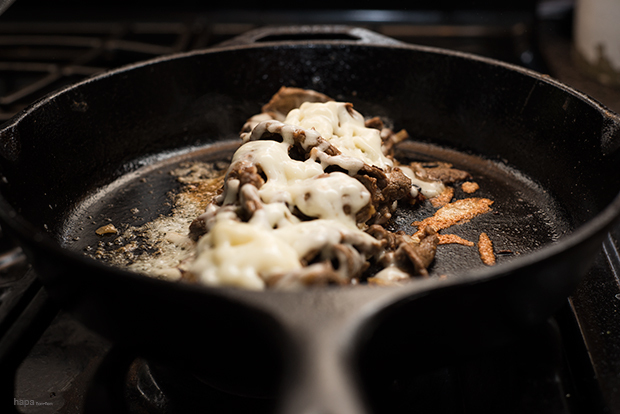 Cover the pan with a lid and allow the beef to cook and the cheese to melt, about 1minute. (You can prepare two sandwiches at time if your pan is big enough). Using two spatulas, one on either side, scoop up the beef and place inside the hoagie rolls. Sprinkle with some crushed red pepper if desired. Serve immediately and enjoy! Pop the sirloin in the freezer for 20 minutes to make slicing easier. Dude, this is brilliant!!! I LOVE this!!! What a beautiful sandwich! Definitely love the spin on the Korean flavor. Oh, I’m feeling hungry again looking at this now, although I just had lunch! Thank you Maggie. I’ve been on a Korean food kick recently and there’s no sign of slowing down – there are just such incredible flavors in the cuisine. I need this sinful sandwich in my hand right now. That bulgogi beef looks divine and it is dressed perfectly with those onions and the gooey cheese. Let’s give Philly a run for their money. Ha! Let’s do it! 🙂 Thank you so much for your kind words Lynn. So, for months I’ve been saying that I want to incorporate red meat back into my diet. I know that it is great for people with low iron such as myself; this dish looks like the perfect kick start to reintroducing red meat into my kitchen. The photographs speak for themselves. I know I’m drooling! 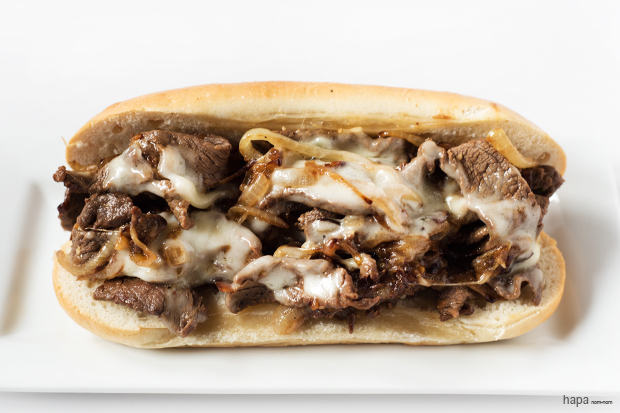 This cheesesteak is mouthwatering—definitely not lacking in flavor. My mouth is watering even though I just had dinner! Great food styling in these photos, Kathleen. Thank Nicole. I’m so flattered that you like my food styling, as you are certainly extraordinarily talented in that department!